You may of heard of lead generation before, but do you really know what lead generation is? Lead generation is the unique way in which marketers and sales people attract potential customers to their business by giving them incentives such as free content, special offers or anything that will pull them towards your brand. So, now that you have an idea of what lead generation is, you may be asking yourself, what exactly is a lead? A lead is an individual or business who has shown interest in your company. Maybe this lead came through your website, social media, blog post, word of mouth or any other form of media channel. This potential customer/client has shown interest by filling out a form on your website, clicking a call-to-action button on one of your landing pages, calling you directly from cell phone, commenting on your Facebook post, or maybe even interacting with your team via LiveChat. The point is, this person has shown interest in your business therefore, the probability of them purchasing a product or service from you is higher than if they’ve never heard about your business before and received a cold call. This type of lead generation is ingrained into the inbound methodology. The purpose of inbound marketing is to get the potential lead to come to you rather than you going out to them. Basically, it’s much more beneficial to your brand and business if the prospect initiates the relationship with you. This type of relationship is more natural, builds trust more quickly, and leads to better sales with higher profit margins. Human beings are reluctant to random cold calls at various hours throughout the entire day. This type of engagement rubs the person the wrong way and is more than likely to have a negative impact on your business. The same goes for random emails to someone’s inbox. You’ll end up being tagged as spam and if you continuously keep sending unwanted emails, you’ll eventually be blacklisted and become profiled by other email providers as a spam account also. How To Qualify A Lead? A lead engages with your business in some form or fashion. But what really qualifies someone as being a lead? How do we know that this person has a genuine interest in what we’re providing? Well, if that person is willing to spend a couple minutes of their time in order to fill out a form completely or read & comment on a social media post, the chances are there’re probably interested in what you’re doing. Not only does this person take time out of their day to engage with you, but if he or she shares their personal information such as first and last name, email address, the name of their company and their role at the organization, where they live and their telephone number then they most likely would expect you to reach out to them. If a visitor fills out all the required form's fields appropriately, and they’re fit within the parameters you set, then they become a marketing qualified lead. Now, you just need to figure out what information you will need to qualify a lead before even speaking to them. For instance, if you are an IT Company and you only service businesses within Illinois, then asking for an address (or at least a state and zip code) will help qualify a lead. Any address outside Illinois will obviously disqualify that lead based on their location. Another example would be a Marketing Company who wants to know a business's current challenges and long-term goals. This one is a little more complicated, because you first have to decide if you leave the field blank for the user to fill in or you develop a drop down list with options that the user can select from. It requires a bit more thought on both sides, but it will match that lead with one of your buyer's personas. If the lead doesn't even have a long-term goal or refuses to share their challenges, then most likely this will be a difficult client to work with or simply they aren't at the level you need them to be to help them properly. At this point, the visitor has found your company, service or product to be potentially valuable to them and would like to know more about it. They may even be ready to make a purchase, but they want someone to reach out to them for a little trust building (to avoid scams) or clarify a few questions they may have. It might even be a test to see how your staff and customer service is before they make their final decision. Although, the initial information given to you by the user may not be enough to close the deal or make that sale yet, it’s a start in the right direction. It allows you to personalize your response to create a positive experience, which leads to more sales and profits. Qualifying leads is a huge timesaver and keep everyone focused and motivated. We now have a clear idea of what lead generation is and how it works, so let’s go over the mechanics of lead generation and the natural flow of leads next. A visitor interacts with one of your marketing channels such as your website, blog, social media profile, etc. A CTA (Call-To-Action) grabs a visitors attention and entices them enough to click on it, which in return brings them to a landing page or buy page. This landing page contains a form which is used to gather information from the user via form fields and even to qualify the lead. The visitor is incentivized into entering their information and completing all required form fields, because you supplied them with an offering from your business. This could be in the form of a free sample, eBook, demo, etc. Remember, it’s always better to generate hot leads than to use cold leads from watered down purchased lists. This is an intrusive way of interacting with people and will hurt your business more than help it in the long-run. Plus, once those bought leads dry up, that's it, you're done and your competitors are thriving. How Is B2B Lead Generation Different From B2C Lead Generation? Lead generation in B2B (Business-to-Business) and B2C (Businesses-to-Consumer) differ substantially. The target audience in B2B lead generation are the decision makers at other businesses which makes the process more complex. Not only do you have to provide a customized and suitable product or service solution to each organization, but it also takes time to nurture these relationships. Not just one either, it's usually multiple relationships within a company. On the other hand, B2C lead generation is fairly straightforward and less complex, focusing on an individual or group as your targeted audience. B2B lead generation includes meeting with several different people within the business including department heads, teams within these departments and even one-to-one meetings with individuals of these companies who may be using the product or service. This means, you’ll have to be able to address the specific needs of each of these meetings and tailor a solution to suit each person or team. B2B lead generation is an ongoing process which involves buying cycles over longer periods of time. Therefore, the nurturing process is longer than in B2C lead generation. The process includes numerous phone conversations, emails and presentations with different groups. As said before, this is a continuous process, so it is likely you’ll be engaged with your potential leads as long as they show interest and even after they have made a purchase. To be successful in B2B lead generation, research is key. You have to know every aspect of the potential lead. Therefore, researching the departments, teams and individuals who will be using the products and services is vital to how you approach them and eventually sell them. Your knowledge of the services & products that you’re offering must be spot on and your experience with their industry. You’re going to be dealing with top executives at the respective organization who are highly qualified and knowledgeable in their fields. Therefore, they will know better than anyone what is needed to propel them to the next level and how your offering fits in their overall strategy. It is also possible to outsource your B2B lead generation. If you do so, it is fundamental that the third-party company knows your goals, has a solid understanding of what your company provides, and its challenges because they will be the ones developing strategies, content, and execution. The more this marketing company knows, the better chances they have to reach goals and solve issues. Choose a marketing company that is willing to develop a solid strategy WITH you & your team, understands your business inside & out, and is trustworthy as your business will be in their hands. When marketing your B2B, you have to be where your potential leads are. If not, you will be wasting a lot of time and energy targeting an audience that will never gain traction or convert into sales. So, it is critical for you to research and understand your audience BEFORE you develop a marketing & lead generation strategy to reach them. In today’s multichannel ecosystem, if you’re not utilizing multiple channels, you’re losing out on potential clients and letting your competitors scoop them up. Plus, you are setting yourself up for failure if you don't diversify, because when that channel's leads decline you have nothing to pick up the slack. What exactly are the optimal marketing channels for your specific business? Well, there is no one size fits all solution, which is why it is so import to do your research and even ask your current clients where they would expect to see your brand. Trial and error is key, because research can only take you so far as trends & technology changes. Email marketing is, and has been, the best channel for B2B lead generation for years now. Not only is email marketing the top channel for B2B lead generation, it is also the top revenue producing channel for marketers. The fact is, everyone has an email account and they check it routinely. Therefore, it is highly probable for your potential lead to see and read your personalized email. Intriguing subject lines increase open rates, so do appropriate emojis, but don't overdue it. Subject lines between 5-7 words generate the best open rates. Personalize emails also increase open rates and helps you stay out of spam filters. Personalization ranging from first and last name, company name, job position, etc. Strong calls-to-action improve clickthrough rates and ultimately help push viewers closer to a conversion. Every email should have an image. If you're selling a product, there should be an image of it. If you're providing valuable information, then you should at least include your logo and branding. Email signatures with a picture of yourself are a great way to build trust so the viewer can put a face to a name or company. List segmentation is key, as well as, buyer persona targeting. This not only helps with sales, but it will help reduce unsubscribes. Email automation combined with workflows are efficient and effective! While it takes time and thought developing this, it is well worth it's weight in gold. Emails are also the most cost-effective of all the different marketing channels and has the highest ROI amongst them. Search Engine Optimization is fundamental when it comes to lead generation. Optimizing your website to land on the first page of an online search for a targeted keyword, can drive valuable traffic to your business and is of tremendous value in order to close leads. Especially if you make it into the featured snippets sections at the top of Google search results. Search engines are valuable, because when someone searches for your keyword or topic using a search engine or voice search, they are actively looking for products or services. This makes the searcher a hot lead and potential customer which you should pay close attention to. If you’re unsure if your website is fully optimized, you should use a free SEO Audit tool to analyze your website and webpages to see how they get scored. The report will offer comprehensive recommendations on how to fix each issue discovered. More helpful articles include 13 organic SEO tips to improve search results, 8 principles to follow for successful on-page SEO, my super effective organic SEO techniques. No one can dispute the power of social media. Social media has grown exponentially over the past few years and now has a huge presence in everyday life. In terms of B2B lead generation, LinkedIn is generally the most used network to nurture connections and build qualified leads, followed by Facebook and then Twitter. Depending on your specific industry, we have found Facebook to be the leader with their in-depth targeting available through paid campaigns. Content is key to your marketing objectives and it’s vital for you to create valuable content for your audience and potential leads. In B2B lead generation, your target audience is the decision makers and teams within other businesses. These are people who are often very educated and are considered Subject Matter Experts (SME’s) in their field. Pay attention to this when creating content. You’ll need to be very detailed, knowledgeable and thorough in your research and execution. 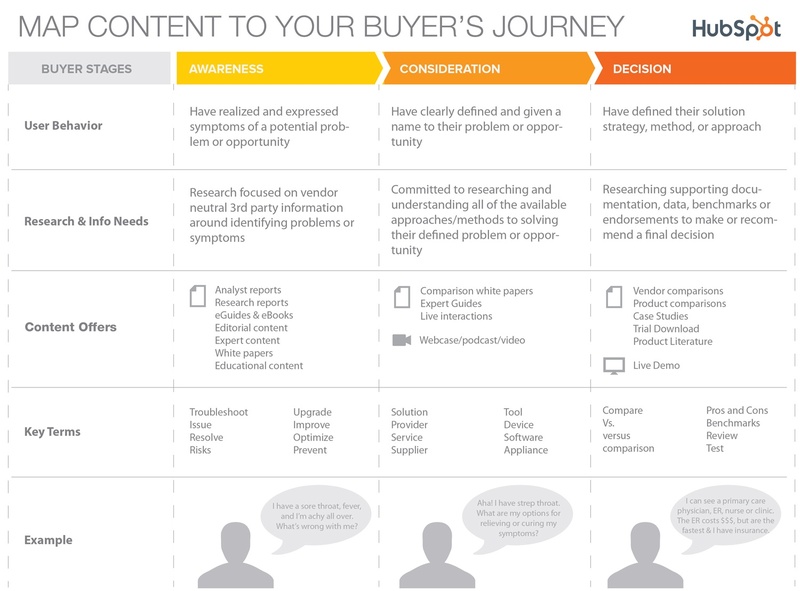 You are going to need to develop content for every step of the buyer's journey (awareness, consideration, decision) and for each of your buyer personas. See image below to help map your content and key terms to where your audience is at in their purchase process. In this setting, there is one type of content that people in the business world gravitate towards the most and that is whitepapers. A whitepaper is a persuasive, authoritative, in-depth report on a specific topic that presents a problem and provides a solution. Word of mouth is probably the oldest marketing channel out there and it’s still as important now as it was then. Especially in today’s hyper connected society. Not to mention it's free! When people use a product or service, they tell their friends, family and anyone listening about it. These users are essentially putting their stamp of approval or disapproval on it and are either validating your brand or hurting it. This can either be a good thing or a bad thing for you based off their experience, so make sure it's a positive experience. This cosign by your valued customer spreads like wildfire, extends a community around your brand, and can turn customers into your best advocates. It's up to your and your business whether people are envious of what you have to offer or scared to even give you a try. Referrals can have a huge impact to your revenue and is also one of the best ROI strategies for B2B lead generation. Which Lead Generation Channels Should You Be Using? In short, it depends. You should do your research, ask clients where they spend most of their time, spy on your competitors, A/B test campaigns, good old fashion trial & error, and more to locate your potential audience. Also, find out exactly how they're interacting within these various marketing channels so you can penetrate those channels, nurture leads, and convert sales. By executing your due diligence, proper experimentation, and analyzing your results you’ll have a better idea as to what’s working and what’s not. Therefore, you’ll know where to spend your resources and budget to maximize quality lead generation. After all, owning a business is all about adapting and overcoming. In order to optimize your content for B2B lead generation, you have to first understand the marketing funnel. The marketing funnel comprises of the top of the funnel, the middle of the funnel and the bottom of the funnel. The top of the funnel helps people acquire general information about a topic. The middle of the funnel dives deeper in into information about the products or services you offer. The bottom of the funnel educates the lead as to why your product is superior and guides them towards making a purchase. Each of these parts of the funnel require specific attention and distinct strategy when it comes to B2B lead generation. The top of the funnel is the awareness stage of a potential lead. This is when your visitor knows they have a problem and are searching for answers to their questions and any possible solutions. The marketing focus here is usually on blogging, social media and SEO. The strategy behind creating content at this stage is to focus on questions your potential leads may have and the solutions to them. You should focus on educating your audience at this stage by creating content such as blog post, social media posts, eBooks, infographics, etc. You should use informational keywords in your content such as troubleshooting, prevent, improve, and issue. These are the keywords used by people who are searching for advice, knowledge and answers to their questions. Using these informative keywords will help your potential leads find you online and in social media. SEO is also very important at this phase. You should be optimizing every page on your website so that you rank high in searches and try to get placed on the first page. Optimizing your website along with using informative keywords will get you the best results at the top of the marketing funnel. Incentives should be used to attract leads such as guides, eBooks, online courses, etc. Remember, they are searching for answers so if you can get them to your platform with just enough information and get them away from any competitor this is a win for you. When someone is in the middle of the funnel, they have an idea of the solution to their problems and most of the answers to their questions, but they’re still weighing their options. This is called the consideration stage of the buyer's journey and have most likely become a marketing and/or sales qualified lead. They want the best offering to solve their problem and this is where your business or brand has to stand out from the rest. Your content should be specific to your products and services, highlighting the strengths and giving reasons as to why the lead should choose you. Be very descriptive and give details about your offerings. Make them become fully aware of what your brand or business does and how it benefits their specific need. Provide resources like landing pages, comparison white papers, podcasts, and expert guides to spark their interest. In the middle of the marketing funnel your focus keywords should be navigational. This means using keywords that are more specific to you like solution, tool, supplier, etc. The lead has a clear idea of what they want at this phase so, use terms that deal with your products and services to get the best results when they search. Also, optimizing your landing pages with calls-to-actions and forms to help convert the lead so you can follow up with a call. Product and service specific branded content is ideal for this part of the marketing funnel. Give the lead as much insight into your business or brand as possible. Draw them in and assure them that you’re the best choice. B2B leads are well-informed and educated about the subject matter so it is essential that you give them just the right amount of information they need to make that final decision. The bottom of the funnel also known as the closing or decision phase, is where lead knows what they want and are ready to make a purchase. Simply put, this is where the magic happens and all of your efforts come to a head. Leads are now using buying keywords such as compare, versus, test, review, and pros & cons. Keywords which indicate they are ready to purchase and are searching for a brand, model or service to do so. Your content should be geared towards this mental phase where analytics and customer relationship management (CRMs) come in. It should be welcoming, and the user should have an easy, engaging experience at this point. Even though they are ready to make a purchase provide them with reviews, case studies, and before & after’s from previous customers so they feel comfortable with their decision. Also, demos and free trials are fantastic for relieving some purchase anxiety, because they get to see it in action before they buy it. This also gives you a chance to prove that you are confident in your brand and confidence sells... as long as you're not cocky haha. You should be starting transactional discussions as well; mentioning any deals or coupons with a time limit put on them. This nudges a buyer to make a decision sooner than later, saving your sales team time on follow ups. The end goal of the marketing funnel is to convert visitors into leads into paying customers. Keeping lead generation in mind throughout this process will give you the best opportunities to increase sales. Once you start collecting leads, you can then build an email list and segment those leads based on where they are in the marketing funnel. This should be an ongoing process which should be constantly refined based on your objectives and the needs of those leads. Try to get as much information from your leads as possible without overbearing the lead. Utilize landing pages and forms by asking precise questions such as job title, company name, annual revenue and number of employees. This is the best way to gage your lead quality, so you have a better idea of how to approach them and eventually convert them. As mentioned above in this article, content is King, but distribution is definitely Queen! Business is all about rapid growth and return on investment, so let’s look at how to achieve rapid growth using content marketing for B2B lead generation to obtain the best return on investment. Having great content is not enough, your content has to be creative. The internet is flooded with great content on just about everything you can think about. So, if you want to achieve rapid growth and generate quality leads you have to distribute your content to the right people at the right time. You need your content to speak for you and draw in the relevant prospects. In general, there are what we call gated content and ungated content. Gated content needs a key to be unlocked i.e. an e-mail address or phone number etc. So, why use gated content? Gated content is content which is unique, meaning there aren’t many other contents online similar to this content. Therefore, because it is unique there will usually be very high demand for it and hence you can use this content as leverage to get information from your visitors. Ungated content is content which doesn’t need a key to unlock it, it’s basically free and anyone can access it without giving their information. Ungated content is important also, mainly it boosts your search rankings, it’s used to maintain good relationships with your e-mail list and keeps you in the minds of your customers. Now, that we have an idea of gated and ungated content let’s look at how to distribute this content. Remember, content is king, but distribution is queen. Promoting your content is key to lead generation. You can have the best content on a particular topic but if no one sees it, it’s useless. There are two ways to promote your content either intentionally or unintentionally. When you promote your content intentionally, you’re strategically pushing your content to as many potential leads as possible. One technique used in intentional content promotion is, native advertising. Native advertising involves blending promotional content with other content on a web page. Native advertising can generate hundreds, even thousands of impressions to your content. This technique, coupled with gated content works very well because, you can spawn a lot of impressions by promoting your gated content and generate substantial lead generation from doing so. Unintentional content promotion is just that, unintentional. It deals with hoping your content is seen and goes viral. We do not recommend this form of promotion because, distribution is vital for your content to be seen and essential for your business to grow. Organic traffic plays an important role in B2B lead generation. Organic search aids the potential lead in their quest to find solutions to problems they are looking for online. If you want to be seen by these leads online, you have to follow certain principles in order to achieve success. Let’s take a closer look at these principles. Display your content – Structure your content in a way to attract the right eyes to your website. You want leads who have a high probability of purchasing, so your content should display keywords and a tone which portrays this. Analyze your content from the customers point of view – Create your content with your customer in mind. Previous to writing your content, you should do the proper research and understand your buyer persona. Put the buyer first, talk to them in their language. Show empathy and remember your visitors have many choices when it comes to shopping online so, relate to their concerns and provide them with viable solutions. Talk like a customer, not like a business – customers don’t want to be sold. There’s enough information online for them to make decisions. So, when their ready to buy, it’s better to have a relationship with them rather than them viewing you as an entity that doesn’t care about them and only concerned with making a sale. Instead of selling them, you have to educate them on your products or services and how you can provide value to them. The key is to provide them with the right information and let them make the decision, don’t pressure them into making a decision. Use anchor-text CTAs – CTAs are the window to conversion. They’re the first step in a potential lead taking the next step in the buyers’ journey to becoming an actual lead. The logic behind CTAs are to make them subtle and not over powering. Let it be natural in the form of text or simple CTA buttons. The goal is to not seem obvious so always keep in mind the visitor doesn’t want to be sold, they want to be guided. Technology is rapidly changing, and the fact is, you cannot count on tactics that worked last year for lead generation to work this year. So, what is working for lead generation right now? Let’s take a look at the three of the best lead generation tactics. Webinars – are very targeted forms of content. Although webinars are time consuming, they are highly engaging because, webinars get into great detail on whatever topic is being discussed. Webinars are visual and highly informative. Therefore, it’s a top content format for converting qualified leads. E-books – are usually free forms of very detailed and compact content used as incentives to potential leads. Using them as gated content is a great way to convert leads. Videos – are vital, especially in today’s ecosystem for lead generation. People spend tremendous amounts of time watching video so, it’s essential to create video content. Blogging – is and will always be a great way to get content into the right hands and keep your audience up-to-date with your business. Not only does blogging keep your audience informed and up-to-date on current advances in terms of your business, it is also great for optimizing your website for search engines. Enough can’t be said about social media. Since social media came into existence, it’s been a force to be reckoned with. Social media isn’t only used to generate leads, it’s also used in the nurturing of leads and leading these leads down the marketing funnel. Social media is usually one of the first forms of contact a potential lead has with your business and even though it is so important, a large number of sales teams are not involved in strategic social media activity. Leads and potential leads may be spending most of their time on these social media platforms so, if you want to build relationships with them you absolutely need to have a social media presence. Once you have a social presence, start researching your followers and gaging their needs so you can build an effective social media campaign. SEO is hands down the best tool for B2B lead generation. Therefore, it is crucial that you get SEO right and implement it into your B2B lead generation strategy. Keyword research – optimize your web content by using keywords your users are using to look for you online. Use these keywords throughout your website and pick those longer tailed keywords with lower search volumes, so you can rank higher in search results. The leads will be better targeted when you use long term keywords. Improve your website design – make sure your website is easy to navigate, as this plays a big role in how search engines rank your site and how your users engage with it. If your website takes a long time to load web pages, search engines will penalize you for this and rank you lower. Mobile optimization – most of online searches happen via mobile device such as smart phones and tablets. Therefore, it is essential to have your website optimized for mobile. Having your site optimized for mobile will greatly improve your SEO and will make it easier for your users to navigate. Guest post – are a good way to get out to your target audience to generate leads. It also helps you build backlinks, which are external links which links back to your website. The bigger the website the better chance you have to draw an audience and drive traffic to your website. Local SEO – is key for businesses trying to generate leads from people located within their local environment. Encourage your customers to leave reviews on your website and online applications such as yelp to help drive traffic to your business. People love to win prizes. Throwing contest on your social media page and offering prizes is one of the most effective ways to use social media for B2B lead generation. These contests are usually easy to set up and allows you to interact with your followers. Contest not only allows you to interact with your followers but, it draws in new followers and increase your lead generation if done right. Contest don’t always have to done via social media. They can be done in real life but there should always be some form of social media engagement, whether it be posting video and pictures of the contest on your social media or posting the invitation to the contest on social media. Whichever way you promote your contest using social media always aim to get some form of information from your followers. The prize for winning the competition should always represent your business in some way or the other and should be valuable enough for people to want to compete in it. As mentioned before in this article, gated content is pivotal in generating leads and social media should be used to promote this gated content. If you know that your gated content is very valuable to your followers, you should promote, promote, promote and promote it some more. The more you promote, the more leads you can generate. Also, these leads might be few when we’re talking about gated content but, these are often very high-quality leads because this type of content is very specific and valuable to this audience. Your website attracts visitors daily but, if you’re not identifying these visitors and logging them into your social media platforms you’re wasting the opportunity to do so. This is how you build an ecosystem around your visitors. You should think of every visitor as a potential lead therefore, connect with them on multiple platforms and build a relationship with them. Social listening involves uncovering potential leads by searching for relevant keywords of your target audience and start building relationships with them. Let’s face it, social media allows social interactions in real time. This means, people are searching social media for products and services, making purchases directly from social media and talking about their buys on there. Social media allows for all types of interactions between consumers and businesses. Therefore, monitoring these interactions can prove to be very profitable when gathering leads. Live streaming is one of the new ways promoting your business on social media. People tune into live streams of their favorite companies to receive valuable content in real time. Webinars are also a prominent way of live streaming used via social media to generate highly qualified leads. Webinars are usually in-depth discussion on a particular topic which has a lot of relevance to your target audience. The two main ways of gathering leads through webinars are by gating your content so that prospective leads have to give their information before gaining access to the content or by allowing access to the content and then offering other content for which the viewer has to then enter information. Your content has to be of value to the potential lead, otherwise they will not be intrigued into giving up information to view it. Even if the content is super valuable to the viewer, it is wise to offer other incentives to the views such as discounts and coupons to your products or services. Use your webinar as a way to drive traffic to your website and once there log them in and build a relationship with them via other channels for example the various social media networks and e-mail. Facebook is a mammoth in the social media world. People of all ages using Facebook from the very young to the very old. It is seen as not only a source of entertainment but also a vital source for B2B lead generation. All industries can benefit from advertising on Facebook because it is so robust and touches such a large subset of the population. In fact, there are over a billion active users of Facebook on a daily basis. This makes Facebook a powerful and dominating platform for lead generation. B2B advertising and lead generation goes hand in hand but, there is a very low rate of success by businesses when it comes to lead generation. Another factor which may play a role in this low success rate of B2B lead generation is the fact that businesses don’t allocate enough budget towards mobile digital marketing. Taking these factors into consideration, let’s discuss three advertising steps on Facebook for that can increase B2B lead generation. CRM data is important for any marketer or sales person and using this data to generate leads through Facebook can be highly effective. You can use the data found in CRMs such as e-mail, and interactions between sales or services to engage customers via Facebook. Think about your most valuable customers on your CRM and build look alike groups on Facebook, using demographics such as location, interest and hobbies. Doing this, you’ll be able to build clusters of groups which you can drive Facebook Ads towards, then test and analyze your campaigns. Facebook lead ads allow you to populate forms with information already uploaded to Facebook by its users, for example name, age, e-mail and phone number. This is an easy and effective way to generate leads using Facebook. It’s no secret, B2B leads are extremely valuable because, just one lead can produce a lot of monetary value. Remember, in the B2B model you’re selling to other businesses not an individual consumer. Therefore, businesses have a lot more money than an individual. Hence, companies trying to be successful at B2B lead generation can afford to spend much more in Facebook ads. To wrap up our discussion of how to generate more B2B leads, let’s put it all together by discussing 18 ways the methods we’ve spoken about improve sales. To increase sales, it’s all about getting high quality leads and converting them. A simple way of thinking about getting more sales is, if you increase your leads by 10% and the quality of these leads doesn’t drop, then you’ve just increased your sales and therefore, your profit. Also, by using these techniques you’ll be able to nurture your customers and get more out of them over their lifetime, hence increasing their customer lifetime value (CLV). So, without further ado, let’s introduce the 18 most effective ways to generate more sales leads. People want a personal relationship with your brand especially nowadays, where everything is digital and robotic. When you have a qualified lead, reach out to them, call them or speak to them via video chat. This in-person communication not only allows you to show a bit of human element to your potential lead but also allows you to sell them better. Social media presence is a must have today. It may be challenging to find the right people at first but as you start accumulating leads, getting similar leads will become easy. Once you have the qualified leads you want, engage with them in the form of conversations, liking their content and inviting them to take part in competitions hosted by your business. Your website is a window for opportunity. Use your website wisely, any interaction with your website can be captured and curated to build a long-lasting relationship with potential leads. Be proactive, don’t just wait for people to enter information into your website. There are many tools online for you to capture this valuable data. There are databases specifically filled with leads for purchase. But, be careful not all databases are built equally. If your business is new and you need traffic quick, this can be a viable option for you. Use marketing automation to nurture your leads and get more data on them. Use this data to segment your leads. You should understand where your lead is in the marketing funnel and address them accordingly. Platforms like Quora, allow you to address potential leads who have questions for which you can provide them solutions and build relationships. Using this type of platform to nurture leads is an excellent way to gain their respect and eventually convert them into buying customers. Write guest post for other blogs that have the target audience you’re looking for. Make sure the content is good and have them post it on their site, with backlinks back to your page. Live chat with your customers and potential leads. Even though you may think your website has sufficient information, some people prefer if they can speak to someone via live chat. E-mails are like engine rooms for B2B lead generation. Optimize your e-mail with proper signatures and links to social media. This can help prospects find you much easier. An E-mail list and we well segmented e-mail campaign is one of the most important aspects to B2B lead generation. Be active, converse anywhere and everywhere you can online and in social media. Your potential leads are on a number of different platforms. If your only producing content for one or two platforms and not for the others you may be losing leads. The key is to create content using different formats and upload to different platforms. A lead magnet is a free piece of content wanted by your customers and potential leads. If you know you have some content that your audience will salivate to get to get their hands on, create a gate to get their information by using landing pages with forms. Some of the highest quality leads are from customer referrals. Turn happy customers into promoters. Reviews on your website are super important because, they show a valid and trustworthy opinion of your products or services from a customer’s point of view. Encourage your customers to post positive reviews on your social platforms and your website. Make sure your landing pages are very specific to what your promoting on that landing page. Don’t have a landing page talking about one thing which leads to another. Social media platforms such as Facebook and Twitter have lead generation ads which allow you to get information from their users such as e-mail, name and location. These ads can be a good way to build relationships and generate leads. If you need a boast in your website traffic, paid ads are a good option. Combine paid with search engine optimization for the best results. If using this method, make sure to research your potential leads and optimize your campaigns to suit your demographics. Spend time crafting your content and be articulate when doing so. Don’t try to hack Google’s algorithms, just understand them and do your research. Keywords and Links are important to SEO, so make sure your content displays these tools within your website.